Opiate overdoses from heroin and prescription pain medications have reached epidemic proportions over the course of the last decade. According to the Centers for Disease Control & Prevention, opiate-induced overdose deaths have increased from 4,030 in 1999 to 16,651 in 2010. For over three decades, emergency responders have used naloxone as an opiate overdose treatment and seen considerable success with this treatment approach. 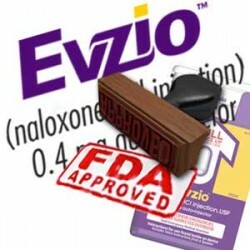 As of 2014, the FDA passed approval on another form of naloxone known as Evzio. Unlike naloxone, Evzio can be used by anyone in the vicinity of an overdose victim. Considering the time-sensitive nature of such incidents, the sooner an opiate overdose treatment can be administered the better. The recent availability of this new medication will likely reduce opiate overdose death incidents by a considerable amount. While Evzio works well as an emergency opiate overdose treatment, it’s still no replacement for needed follow-up, medical attention. Evzio is the most recently approved opiate overdose antidote. Overdoses result from too large a dose of opiates, which quickly sends the body into respiratory failure. As first responders, paramedics and emergency room staff administer opiate overdose treatment in the form of a naloxone injection, which stops the effects of opiates in the body. Depending on the severity of the episode, the time it takes for emergency responders to arrive may be too late. Interestingly enough, those in attendance may hesitate to call 911 for any number of reasons. According to the U. S. Food & Drug Administration, emergency responders are only called an estimated 10 to 56 percent of the time. Concerns regarding outstanding arrest warrants, maintaining anonymity and possible parole violations prevent bystanders from seeking needed opiate overdose treatment. In effect, opiate toxicity can cause key brain regions to shut down, which in turn leaves vital bodily processes in a state of disarray. Naloxone, an opiate antagonist medication, quickly expels opiate materials from affected brain cell receptor sites within a minute’s time and allows normal brain functions to take over. As of April 2014, Evzio, a naloxone hydrochloride injection, was approved as an opiate overdose treatment for use by laypersons. Evzio delivers a single dose of naloxone from a hand-held auto-injector unit. As some opiates can produce prolonged effects, multiple doses of Evzio may be needed to stabilize the victim. While the device is fairly straightforward in design, those who may see a need to use it should undergo necessary training to ensure the safety of the person being treated. While opiate overdose treatment does stop the effects of opiates, in certain cases, stopping opiate effects can bring on severe withdrawal symptoms, such as seizures, cardiac arrest and/or vomiting. Since these symptoms can be just as life threatening as an overdose, immediate medical attention is still required. As overdose essentially traumatizes the system, lingering effects can develop into serious medical problems down the road. For this reason, seeking immediate medical care is still warranted in cases where a person doesn’t display symptoms of severe withdrawal.